One of the larger challenges your CFO faces each month is providing you, and providing your lenders and investors, with straightforward and insightful information that helps you properly manage your cash flow and make smart decisions about how to use your cash. One of the reasons this is such a challenge is there is no single number you can look at to measure cash flow each month. It’s not like revenues, or gross profit, or net income or even your actual cash balance. Managing cash flow properly requires that you know and understand the handful of key drivers of cash flow in any particular month. It creates a wonderful opportunity for your CFO to go past just providing financial statements (which can be a bit tedious at times) and take a more creative approach to providing you insightful information about cash flow. And to do it in a way that is as much educational as it is informational. I have found several different approaches and tools that have worked well for me over the years in my role as CFO. I talked about the power of a cash flow dashboard in a recent post. Now let’s talk about a tool I call the Peace of Mind schedule. 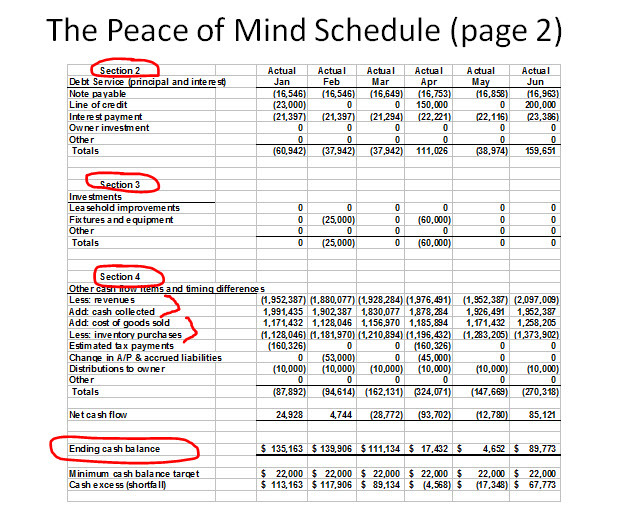 The Peace of Mind schedule was born back when I was the CFO of a nice little company that, unfortunately, had one very nasty cash flow problem. While our lender had been working with us through our cash flow problems, they were becoming impatient. Worse, they were beginning to question whether the management team really had the cash flow of the business under control. We needed new payment terms and a new payment structure so we could pay the debt and not have to keep going back to them with excuses about how we were unable to meet our commitments. One of the challenges in creating the new payment terms was that the business was highly seasonal. Net income was great in certain months. But that’s not how the cash flowed through the business. 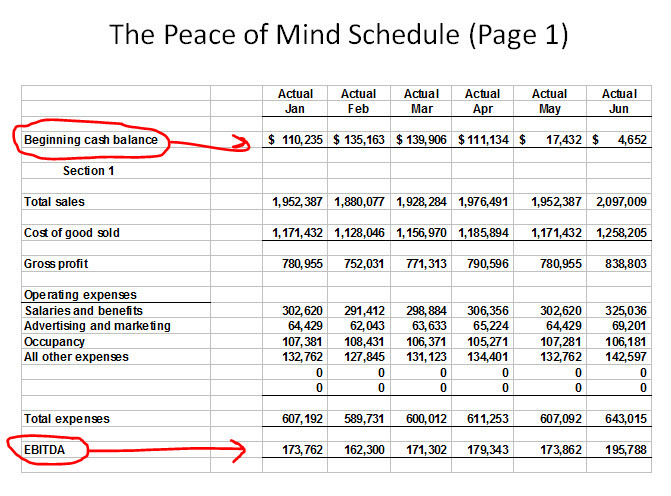 I created the Peace of Mind schedule format to help the lender more clearly see the difference between our stronger net income months and the timing of the related cash flow. It presented the information to them in a way that made it super easy for them to understand exactly how our cash flow worked and why their previous demands for payment terms were totally unrealistic. The schedule is designed to show twelve months of cash flows next to each other. The first six months are actual results (as you see in the image below). The next six months in the schedule are going to be our cash flow projections. The projections are going to help us answer the all-important cash flow question “what’s about to happen to the cash”. The schedule starts with the beginning cash balance for the month. In section 1, I bring in a summary version of the income statement. Here's an important point I'd like you to jot down before we continue. This is not intended to be a sources and uses of cash schedule. This is not a picture of the flow of cash in the door and the flow of cash out the door. That’s a very important point. You want to help people relate to profitability from the income statement as part of showing them each of the key drivers of cash flow for the month. You don’t want to try to present a cash basis view here. That will defeat the whole purpose of providing education and insight to the users of your monthly financial statements. Section 4 is what makes the schedule so unique and powerful. This part of the schedule is primarily focused on capturing the various “timing differences” created in your income statement by the accrual basis of accounting. Some of the biggest timing differences in your business will likely be related to accounts receivable, inventory, and accounts payable. This section played a big role in helping me teach management and lenders the difference between the revenue number in the income statement and the cash we actually collected during the month. It’s also a great way for you, or your CFO, to get your staff focused on setting targets and goals around how much cash you should be collecting on receivables in any given month. I have found this to be incredibly effective in getting people focused on collecting receivables (in addition to working the accounts receivable aging reports). Same thing goes for inventory. It’s easy for people to lose sight of how much inventory the company is actually buying each month. Shine the light on inventory purchases like this and you find that management starts paying a little closer attention to what’s going on with inventory (since we all know inventory is where lots of dead bodies are buried). Then the schedule computes the ending cash balance for the month. We started with the beginning cash balance for the month, captured each of the key drivers of cash flow, and arrived at the ending cash balance for the month. Right there on two pieces of paper. This is the same tool I use to create cash flow projections for the coming months. The projections are shown right next to the actuals. Put the Peace of Mind schedule to work in your business. It will help you present a clear and easy-to-understand picture of what’s really going on with your cash flow. Note: If you want to learn more about the Peace of Mind Schedule and how to implement it in your business, it’s the subject of my Philip’s book Never Run Out of Cash: The 10 Cash Flow Rules You Can’t Afford to Ignore. Philip Campbell’s Blog is dedicated to helping you get the accounting and financial side of your business under control. 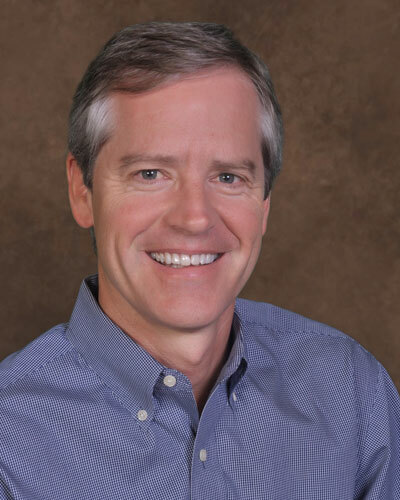 Philip Campbell is a CPA, consultant, and author of the book A Quick Start Guide to Financial Forecasting: Discover the Secret to Driving Growth, Profitability, and Cash Flow Higher. This new book provides a straightforward, easy-to-understand guide to one of the most powerful financial tools in business: a reliable financial forecast. He is also the author of the book Never Run Out of Cash: The 10 Cash Flow Rules You Can’t Afford to Ignore. 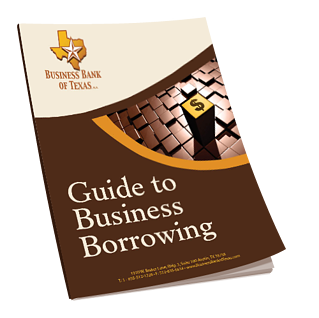 The book is a step-by-step guide for business owners and managers who want to better understand and manage their cash flow. Since 1990, Philip has served as a financial officer in a number of growing companies with revenues ranging from $5,000,000 million to over $1,000,000,000. He has been involved in the acquisition or sale of 33 companies (and counting) as well as an IPO on the New York Stock Exchange. Philip loves helping entrepreneurs and business owners think strategically about the financial side of their business. His consulting work is focused on providing the financial insights that leaders need to increase profits, improve cash flow, and enjoy the fruits of financial success in business. What really sets Philip apart from the average financial person you meet is his passion and excitement about helping entrepreneurs and CEOs take control of their cash flow. In fact, early on in his career, he focused and “preached” so much about the importance of cash flow that people now call him CASH. Philip is the founder of Financial Rhythm, a website devoted to people who are serious about creating financial health, wealth, and freedom in their business. If you're an entrepreneur or business owner, Financial Rhythm is a place to get simple, actionable strategies for creating a financial future that is bigger and brighter than your past. Philip lives in Austin, Texas. You can email Philip at pcampbell@pdq.net.